Most people are opted to encrypt some important and confidential PDF documents with passwords.But what if you forget or loss the passwords? This situation happens a lot in companies and businesses when employees have left the company and forgot to turnover passwords of important PDF documents. PDF Password Cracker Enterprise edition is a PDF password remover, which can enable document owners and users who have lost or forgotten password to access PDF files. PDF Password Cracker has three different versions-PDF Password Cracker, PDF Password Cracker Professional edition and PDF Password Cracker Enterprise edition. All of them can be used to remove passwords from encrypted PDF files without other changes to the PDF documents. Just like the professional edition, it can recover user passwords with brute-force and dictionary attacks and support key search attack to decrypt PDF files with 40-bit encryption. PDF Password Cracker Enterprise version has two different functions which are different from the other two versions of PDF password remover. Firstly, PDF Password Cracker Enterprise version can remove more security options from PDF file. It can remove meta data, private data, java script actions, form actions,embedded thumbnails, embedded file, bookmarks, digital signatures, comments, named destination, etc. Secondly, PDF Password Cracker Enterprise version can recompress the data streams. With more efficient compression methods, it will recompress the text and line art in the PDF document, which can lead to 10-15% savings. Load →Decrypt→Save, only a few clicks, you will remove password from PDF. Sounds great, right? If you want to learn more about this advanced PDF password remover tool, you can post below or contact support@crackpdf.com. 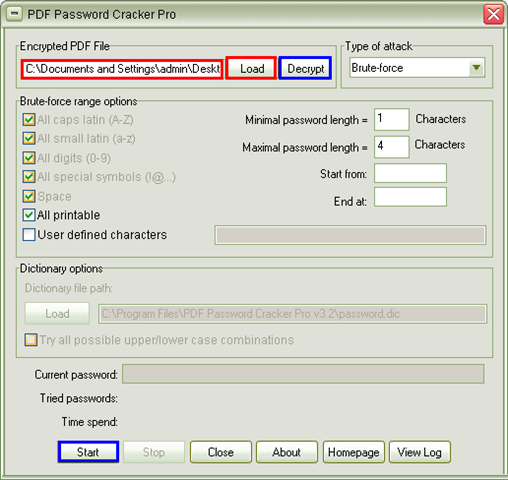 In this article, you will see a free trial application which has the capability to act as a PDF password remover and its name is CrackPDF PDF Password Cracker Pro. This application is specially designed to unlock PDF document which is limited to be opened with user password and printed, copied, modified with owner password. Double click the application icon. Click Start—All Programs—PDF Password Cracker Pro v3.2— PDF Password Cracker Pro v3.2. Click Load button to open file picker window and choose the document that you need. Drag the document and drop it into the application. Type the document directory in the box beside Load button. Brute-force: When you choose this method, you can specify the PDF password like the length, number, symbol, etc. in Brute-force range options group box. Dictionary: When you choose this method, the options in Dictionary options group box will be activated and you can use the dictionary file on your computer by clicking Load button. Key search: When you choose this method, this PDF password remover will help to remove PDF restrictions by traversing all possible passwords one by one until the password is found. When the password is found, please save the target file in popup Save as window in which you are able to set document location and file name. Please click here, you will be able to enter the homepage of PDF Password Cracker Pro and purchase it if it is the one that you need. If you still have other questions about the product, please contact the support team of CrackPDF. 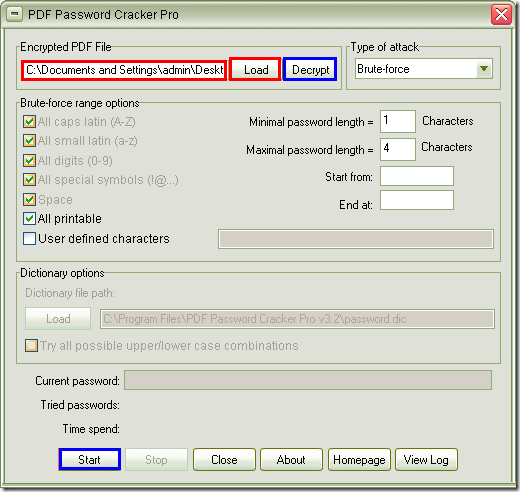 To remove PDF password, you might as well have a try of the powerful application of CrackPDF—PDF Password Cracker Pro which is a program designed for removing user and owner password for the password protected PDF document with three methods: Brute-force, Dictionary and Key search. When using PDF Password Cracker Pro, you can freely stop the password removing work and the application will save the current state for you. Of course, you can restart it any time. 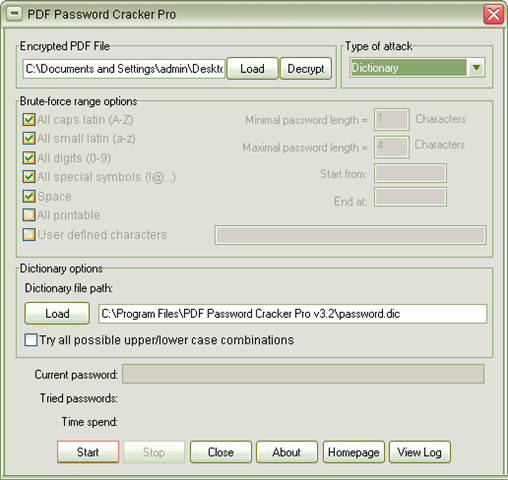 To use PDF Password Cracker Pro, you can click here to download the free trial version and install it on your computer. You can open the application via all program or just double click its icon. 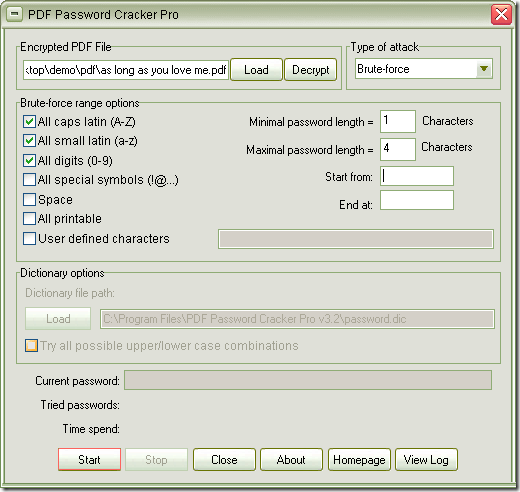 The interface of PDF Password Cracker Pro is like the one shown in Figure 1. To add encrypted PDF document into the application, please click Load button to open file picker and choose the file that you want to remove PDF password. Or you can directly drag the file and drop it into the application. Please choose a suitable cracking method to help you remove PDF password in Type of attack box. If you choose Brute-force, you can specify the password yourself in Brute-force range options group box. For example, if you remember that there are caps latin in PDF password, you can check the option All caps latin (A-Z). You can also set the max and min password length. 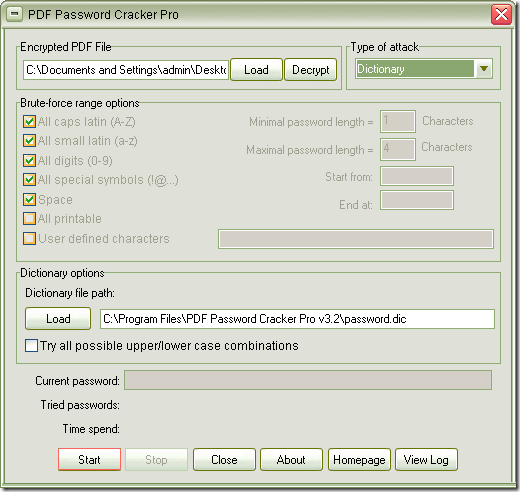 If you choose Dictionary, PDF Password Cracker Pro will find the password according to the dictionary file of the application or you can load your dictionary file on your computer by clicking Load button. The last way is Key search which may cost a long time to remove PDF password. It will traverse all possible PDF password in the processing course. When the password is found, it will be shown in Current password box and a window for saving PDF document without password will pop up. Just choose the destination and the file name, then save it. If you want to stop the removing course, you can click the button Stop at the bottom of the program and when you want to restart the course, just click it again. To learn more information about this powerful PDF password remover, please visit its homepage and you are able to purchase it there.